An Dwejra Tower illustration dated 1824 and published in The coastal fortifications of Gozo and Comino. The Azure Window seems to have inherited its name from a less-popular crevice not far away. As Malta went into mourning following the rock's collapse last week, one photo shared on social media shows an entry from Godfrey Wettinger's Place-names of the Maltese Islands that provides a 1647 description of ‘Tieqa Żerqa’. The meaning is given as: "The blue window, from the dark blue colour of the sea in the cave." Several thought this could shed light on the Azure Window’s origins, however Wettinger's description is for a cave entrance to il-Qawra tad-Dwejra, as quoted by Ġan Franġisk Abela in 1647. The same reference was made in the mid-18th century by Ġan Franġisk Agius de Soldanis, who spoke of an inland sea leading to the open sea through a cave called ‘Għar iż-Żerqa’. Both Abela and Agius de Soldanis were referring to the inland sea found in the area known as il-Qawra tad-Dwejra, lecturer Olvin Vella told Times of Malta. Most know of this cove as the place from which they were able to take a boat and pass through the original Tieqa Żerqa and sail out to the open sea, a vista offering a good look at the towering Azure Window. Dr Vella notes that in his Il Gozo Antico-Moderno e Sacro-Profano, Agius de Soldanis does not make reference to the Azure Window, but he does mention the Fungus Rock, meaning that the former had probably not yet formed. 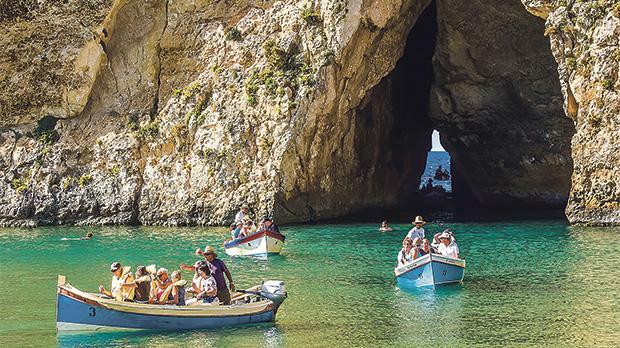 Times of Malta yesterday carried an article questioning the date of origin of the Azure Window as is popularly held. Photographer Daniel Cilia spoke about several land and seascape paintings, drawings and etchings of Malta, including a journal entry by Edward Lear, who went to Dwejra in 1866. "Having drawn it [the Fungus Rock] I toiled up and up ­– but the coast scenery is not nearly as fine as that of Malta," he says. Meanwhile, a photographic album of surgeon Michael Dundon, dated July 26, 1879, shows photos of the Dwejra Azure Window by photographer Richard Ellis. This means the window probably formed between 1866 and 1879. 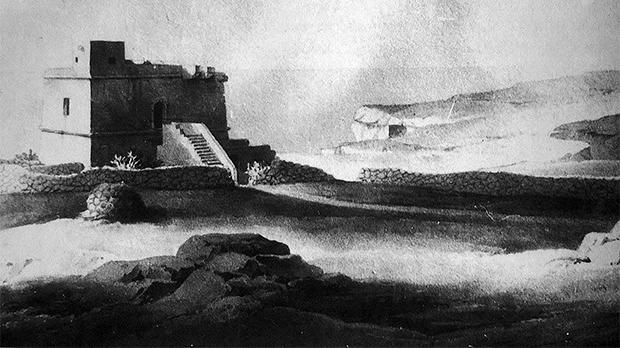 However, reader Andrew Borg reacted with an illustration from 1824 of Dwejra Tower published in The coastal fortifications of Gozo and Comino by Alfred Sammut-Tagliaferro. "The Azure Window can be seen in the background of a black-and-white illustration, however it is unclear whether it was already an archway or still a cave."